Researchers working off the Shimokita Peninsula in Japan have discovered living microbes buried 8,000 feet below the seabed, a new record. And because they resemble those found in forest soils, these organisms likely survived for tens of millions of years after being buried under the seabed. Microbes have never been discovered at depths this deep, where the pressure and heat are intense. Prior to this investigation, the previous record was 1,922 meters (6,305 feet). 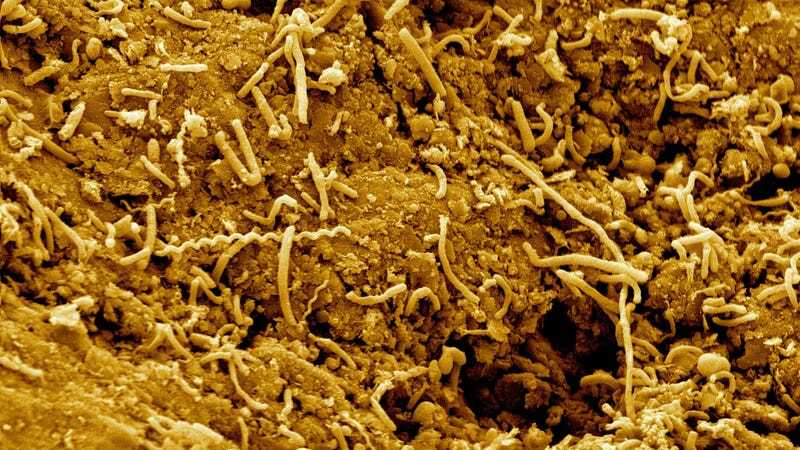 It is possible that the microbes the team found are the descendants of terrestrial microorganisms that adapted to life under the sea as their home sank below the surface. But it’s also possible that these microorganisms are the same cells that were alive when the habitat began to sink, meaning they are more than 20 million years old. “We don’t know exactly the turnover rate of cells” in this environment, [co-author Fumio] Inagaki says. Indeed, these organisms could provide a glimpse of what terrestrial life was like tens of millions of years ago. The microbes, which were found on a coal-bed below the seafloor, likely survived by extracting energy from coal and hydrogen. Their metabolisms may be running at very low levels, but they’re alive and well—even after their original environment was pushed underground more than 20 million years ago. Much more at AAAS Science Magazine. And check out the entire study at Science: “Exploring deep microbial life in coal-bearing sediment down to ~2.5 km below the ocean floor”. Contact the author at george@io9.com and @dvorsky. Top image by JAMSTEC/Hiroyuki Imachi.